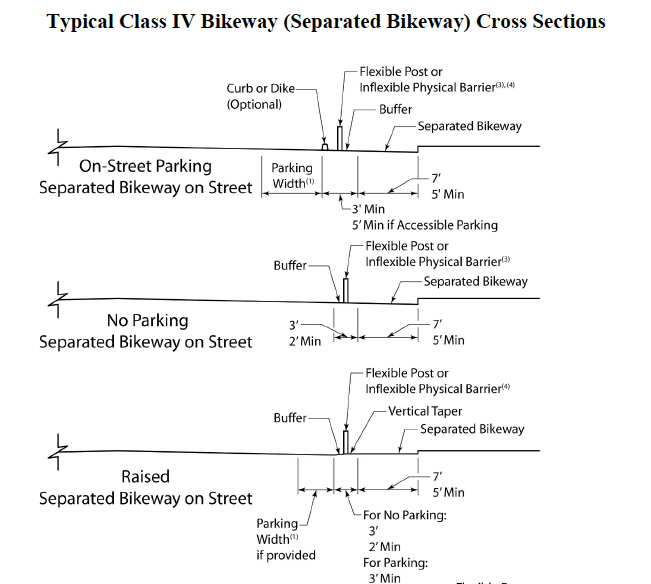 Squeezing up on its statutory deadline, Caltrans issued its “Class IV Bikeway Guidance [PDF]” on the last day of 2015. There are already existing sources of information on best practices and engineering guidance for protected, or separated, bikeways but this is the first from Caltrans. It was prepared in response to the Protected Bikeways Act of 2014, a law sponsored by the California Bicycle Coalition that mandated Caltrans create an official category of protected bike lanes and write guidance for planners and engineers to build them. This “design bulletin,” a supplement to the state’s official Highway Design Manual, defines various types of protected bikeways, provides examples, and refers to existing publications (including federal guidance) for specific standards. That Caltrans issued this is a big deal. The lack of official standards for protected bike lanes in California has sometimes been an obstacle for local planners, engineers, and advocates who want protected bikeways. Engineers and planners look to Caltrans for transportation standards, even for local streets and roads that are not directly controlled by the state department. Issuing a set of guidelines that provide background, resources, and consistent standards gives local jurisdictions some certainty about planning protected bike facilities. 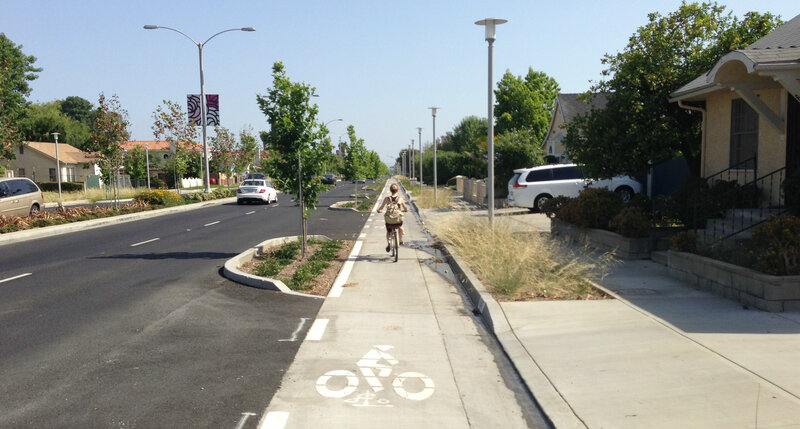 To write them, Caltrans engineers relied on new federal guidance as well as other publications including the Massachusetts Separated Bike Lane Planning & Design Guide and NACTO’s Urban Bikeway Design Guide. “We didn’t want to reinvent the wheel—we were thinking the federal guidance is a good broad-based guidance for everything, from building all the way to maintaining facilities,” said Kevin Herritt, chief of Caltrans’ Office of Standards and Procedures and the project manager. The writing team coordinated the federal guidance with California laws and regulations. “We have our own requirements that we have to conform to, such as the MUTCD (Manual of Uniform Traffic Control Devices), and signage standards,” said Herritt. The first step in developing the guidance was a gathering last May of interested stakeholders, including advocates for bicycling, walking, and disabled communities, city and county engineers and planners, and transportation planning organizations. At that gathering a wide range of perspectives was aired, as summed up in this report. Caltrans formed an external advisory committee representing various points of view. The committee reviewed drafts of the guidance as they came out last fall. Snyder points out that as a “living document,” the design guidance can keep evolving. “I have a lot of optimism that Caltrans can develop the best guidance in the country, or at least as good as the best guidance,” said Snyder. The new guidance “gets the job done, and even breaks new ground in referring to protected intersections.” At CalBike’s urging, the final guidance includes a discussion of how to continue protected bike lanes through intersections, so they do not just disappear as they approach cross streets. Another good thing about the guidelines, according to CalBike’s analysis, is that it uses permissive, rather than restrictive, language to encourage engineers to use their own informed judgement when making decisions. There is still work to be done. 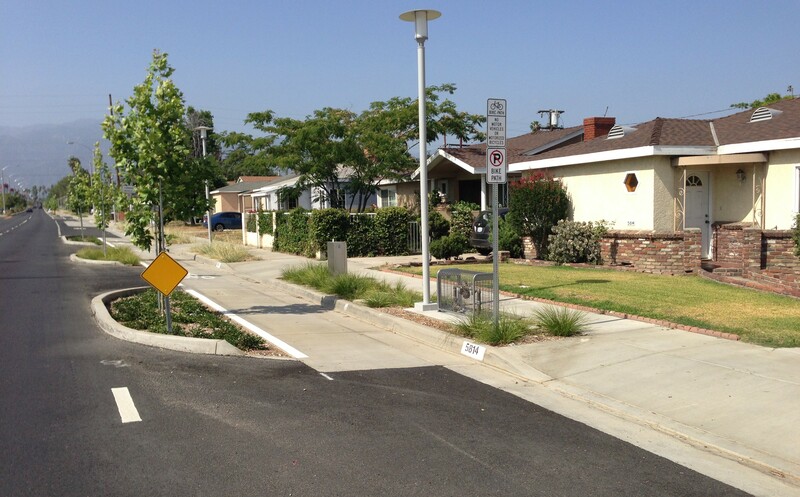 For example, the bulletin makes it clear that Caltrans engineers still consider it an acceptable solution to “discontinue” a protected bikeway at driveways or loading zones. Although the permissive language gives engineers some leeway, acceptance of this “solution” to what is a universal design problem could keep bikes at a disadvantage, and could make it harder to create quality bikeway networks in some areas. Where local pressure, habit, or a lack of imagination dictate that it is easier to interrupt a bike lane than solve a tricky design dilemma, that “solution” may end up looking like an acceptable one. Then new bike riders will be left to to figure out what to do when their protected facility suddenly disappears. As Snyder says, “keep up the good work,” Caltrans. But keep working. I definitely agree on the design part, but saying that parking removal is “less contentious in suburban areas” couldn’t be further from the truth. Parking is sacred out here; people are still fuming about the few spots that got removed for sbX. Many newer developments of course don’t allow parking on the arterials at all from the onset, but trying to remove it in the few places that do allow it is unbelievably impossible. The only reason that it may appear to be less contentious is because no one ever tries it. Considering that it recommends that those sorts of barriers be between 10 and 20 feet apart, it shouldn’t be too hard to park in a manner that allows people to not hit them with a door. Yes, if the road is really “too narrow”, then remove the parking. Really? I did not know that. Agreed, bikes passing to left of driver-side would need more. That’s why flexibility in the regs makes sense: 3′ required in most situations, can get away with 2′ in some spots where road’s too narrow. Don’t worry, something is on the way. The issue at driveways/alleys/etc. that Caltrans is talking about and is recommending against could best be summed up in this post about “visual priority“. Caltrans is saying that instead of continuing the bikeway through the conflict zone at grade level, that they be lowered and use the otherwise conventional treatments in those areas. That would lead to a rather bumpy ride, especially if the transitions are not designed well and/or there are frequent crossings. The good news is that there aren’t a whole lot of grade-separate (i.e. a few inches above the roadbed) facilities yet and in theory, the recommendation would only be applicable to them. However, I can see it causing problems elsewhere as engineers misunderstand where it came from and the true intent (likely because it otherwise creates an ambiguous situation under state law). Hopefully, CalBike can talk some sense into them soon, but the issue really extends far beyond just the design. That’s a problem in cities, but many greenfield developments are also suffering from the lack of standards to just build standard Class II lanes everywhere. When used in those situations, that means that the drainage designs can be addressed in the design. 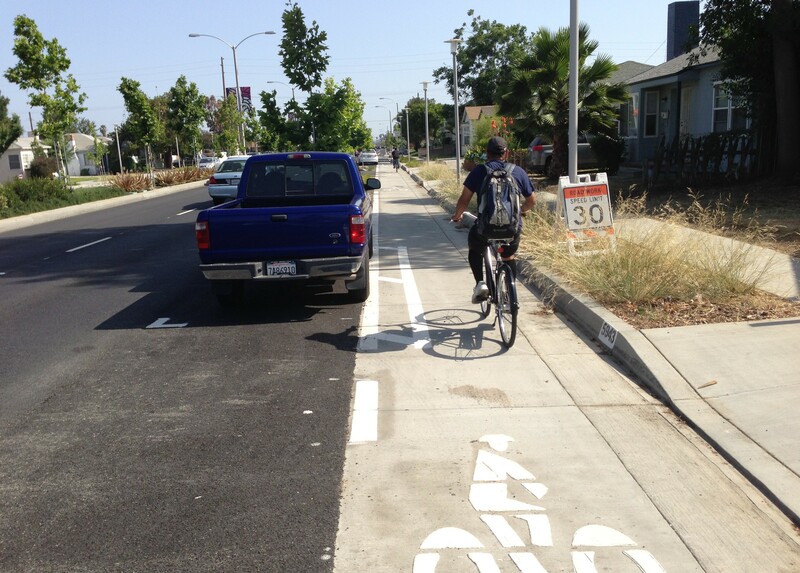 On a parking-protected bikeway that’s on the “right” side of traffic, that may be true. But bikeways that are on the left side of a one-way street, which is what Caltrans is kinda preferring to recommend, would definitely conflict with drivers accessing cars and especially at the minimums, will be a problem. I agree that configuration wouldn’t work. Surely that’s something to be addressed by an appropriate design choice. I don’t believe I’ve seen an empty buffer, and then a wall/planter box. A raised curb with breaks for water flow would be the ideal buffer: imposes hard boundary for car tires; can be stood on; allows doors to swing open freely. You misunderstand me. If there is a vertical “flexible post or inflexible barrier” (as described in the image) only 2 feet from a car door, yes, for some people that is not enough room to open the door and squeeze out. Do I wish that the minimum were less so protected bike lanes could be everywhere? Yes. But this is a pretty practical minimum if there’s going to be a wall, bollard, or planter near a car door. Yeah, and these instances both include a driver dropping someone off. Usually this doesn’t happen in a parking space, which are typically full – it’s either in a loading zone, fire lane, or in a backed-up lane of travel (or bike lane!!). I’m guessing your friend swerved to pass the stopped car on the passenger’s side, which I think all bikers recognize as a maneuver that holds heightened risk due to right-hooking. Where there’s a protected bike lane with a 2′ buffer, bikes will already have their own lane and won’t have to suddenly swerve around braking cars. The left side of a bike lane would already be known to be slightly more vulnerable where the buffer is narrower, so bikers can be more on guard when riding to the left. So even if a taxi/uber pulls over next to the buffer to unload, bikers will be on the lookout for exactly this behavior. And in the case where taxis are stopping in a travel lane to let their fares out: they’re no nowhere near the bikes. Point is, if we only have room for 2′ buffers, they’re still a huge safety gain. I’m not an engineer, but I think sewer work is only necessitated when a raised cycletrack which moves the curb line is constructed, which is one reason why these otherwise great facilities are so expensive and hard to justify. When a standard protected bikeway is along the curb instead of a Class 2 bike lane in the street, though, drainage issues do at least become more critical, so I appreciate the need to include mitigation in the design criteria even if the sewers are not actually moved. Hopefully the sewer grates themselves wouldn’t be a significant concern, considering that bike-friendly grates have been mandated in California since the 1970s for any new installations. As for a cycletrack-sized street sweeper, I’ve priced them out at around $300k each. I don’t know of any existing plans Oakland has to purchase one. Thanks for giving your take – I know you have a pretty deep working knowledge of the issues in Oakland. I’m not surprised about the street sweeping reasoning; that’s very sensible. Is the acquisition of narrower equipment under discussion at the city level? One other potential engineering obstacle I’ve wondered about is whether storm drains need to be reconfigured, or if it’s acceptable to leave them where they are, even with a bike lane in place? Because it’s kind of silly to hold such a hard line on minimum bike lane widths, when I imagine that part of that minimum will be, at certain times of year, taken up by flowing storm water. Or are minimums expanded when adjacent to gutters? A friend of mine was doored on the passenger side just like this, by someone exiting a stopped taxi on Market St. At least with taxis, you can recognize them as taxis. Uber and Lyft cars are more difficult. For cars parked along separated bikeways though, passenger car doors open less frequently that driver side doors. While I believe that a 3′ buffer is useful, I do also agree that using it as a reason not to implement a protected bikeway is fairly disingenuous. In part because most of our standard Class 2 bike lanes around town do not have a 3′ buffer between parked cars and the bike lane, even though getting hit by a driver side door and pushed into moving traffic is much more dangerous (and likely) than being hit by the passenger door and pushed onto the sidewalk while in a cycletrack. Despite what you may have been told the main reasons why Oakland hasn’t been building more protected bikeways so far include 1) lack of planning staff to do design and outreach 2) lack of political will to deal with concerns over things like parking loss 3) lack of funding to pay for expensive curb work/signals/paving/drainage/maintenance. It seems silly, but one of the reasons why the Telegraph protected bikeway is going to be so wide (7’+3′ buffer) and with no bollards is because the city doesn’t yet own a street sweeper that can fit into a narrower space. Even on a narrower street than Telegraph, there is usually still room for an adequately buffered, protected bikeway (most of Grand Ave is even wider than Telegraph, for instance). What is actually often in short supply is the political will to narrow or convert travel lanes, or to lose some on-street parking, in order to accommodate high quality bikeways. Ugh, super bummer. I’m not saying the risk is nonexistant, simply that it’s much, much lower; so much so that it’s quite a weak reason not to give bikes much-needed protection from moving cars. Only true if we accept at given the presumption that the public taxpayer has a duty to pay the costs of subsidized parking for private automobiles. I’ve been told by Jason Patton at city meetings for multiple projects that there’s not enough room for protected bike lanes because of the 3′ buffer rule, and I’m pretty certain Telegraph was one of them. Grand was another. There was a shortfall of 4′ total in one case. If regulations permitted limited stretches of 5′ bike lanes and 2′ buffers, that would free up an additional 2′ on both sides of the road, permitting the installation of these critical pieces of life-saving infrastructure. This inflexibility over a foot here and there is a case of the perfect being the enemy of the good, and perpetuates the public safety threat of cars next to vulnerable street users. Look at the buffer label in the top diagram: they specify a 5′ minimum for ADA accessibility, so I wouldn’t think the justification for the 3′ version is accessibility. Do you know more on this? Agreed on the need for further raised bike lane guidance. From what I understand the 3′ buffers are to meet ADA requirements for passenger loading/unloading. A 2′ buffer doesn’t prevent that. In fact, it gives a minimum of 2′ for that activity, with the flexibility for more if people wait for gaps in bike traffic. Watch cars parking and count the number of times people exit on the passenger side – it’s shockingly low. No, Telegraph is largely the same width all the way up. The transition from a parking-protected bikeway on Telegraph south of 29th to a standard buffered bike lane north of 29th in Oakland is due mainly to the poor curbside pavement quality on the northern segment, which would make biking there uncomfortable and somewhat dangerous. If the city can find funding to pave at least the curb lane north of 29th then a protected bikeway will be feasible there too. I believe that the 3′ buffer is intended in part to help with ADA compatibility, giving an individual a space outside of the bikeway to travel along and reach a curb ramp. With that in mind I would like to see a future revision of the document which includes raised bike lane guidance without the required 3′ buffer, as individuals with disabilities who park in the street will be more able to traverse the bikeway and reach the sidewalk in that case. I would imagine it’s so you can open the passenger-side door and get out once you park. That’s kind of important. That photo shows one example of a way to build protected bike lanes. The Caltrans guidance includes various suggestions for building them alongside parking, as shown by the illustration further along in this post. From the picture it looks like Temple City (wherever that is) doesn’t have much need for street parking. Presumably the homes and businesses are set back from the highway with adequate off-street lots. And just as well because that design would remove huge amounts of on-street parking. So this will work well in suburbia but could not work in, say, San Francisco. And how could bike lanes not “discontinue” at driveways and other locations where there is cross traffic? I remain unconvinced that the benefits of 3′ buffers – reducing dooring on the infrequently used passenger-side doors of stationary cars – outweigh the substantial drawback – insufficient space for installation, eliminating untold miles of streets from consideration for this much-needed protection from speeding hulks of metal. Though far from perfect this is a real milestone for Caltrans and communities in California, who will no longer be able to dismiss the best of these guidelines as “experimental.” Props again to CalBike for pushing for the inclusion of protected intersection guidance. As Melanie points out, the optional element of this stuff remains problematic. What’s really important is pushing for legislation to *require* continuous protected bikeways above certain speed thresholds (25mph, for example). I believe CalBike’s on that, as well, for their 2016 agenda. Here’s to that happening!